First off, I find it hilarious that Audrey, of Hot Pink Quilts called this quilt Baby K’s Quilt, because the baby I’m making for it? His last name starts with a K! It fits perfectly! Part of the challenge for me on this one was to work entirely from stash: I’ve got a lot of fabric, and I really need to use it! And as much as shopping for more fabric is fun, I really can’t justify it right now, with the volume of stuff I already have. Luckily, I was able to cut nearly all of the little squares of it from scrap! The only ones that didn’t come from scrap are the little black and white Daiwabo elephants, the blue pigs and the 1001 Peeps fussy-cut people and horses. Everything else was leftover from previous projects — and I’ve been cutting scraps into 2.5″ squares for a little while now, which was a big help. The borders were a quandary. I have a lot of black and a lot of white, but neither of those says “baby” to me — particularly not white, since, oops, stains! 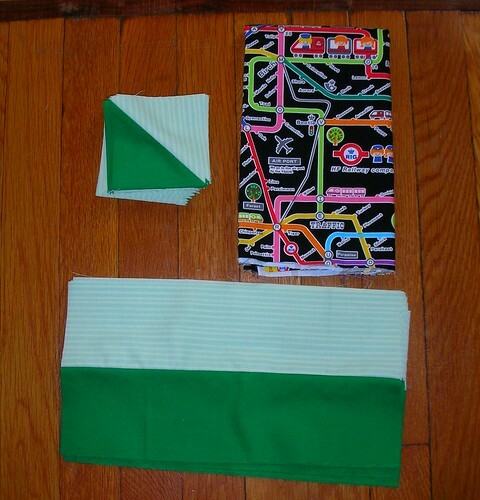 I had a yard of Kona Kelly green that had no particular intended use, and two half-yard cuts of the green stripe from Hello Pilgrim, which (when I stood back and looked at my stash for a moment) started hollering “baby quilt!” at me. I think the two of them together should work nicely! There was one oops: I cut three strips of the Hello Pilgrim stripe before I remembered that I wanted the stripes to go lengthwise, not width-wise. Ooops. Now I have a few strips of 3.5″ wide green stripes. I’m sure I’ll find a use for it eventually. That reminded me that I’m not certain how I’m going to make sure that the stripes in the pinwheels line up properly with the stripes in the borders (problem with a directional patterned fabric!) but I suppose I have time to fiddle with that. And if it’s not perfect, it’s not perfect. I’m going to use a half-yard cut of an adorable Japanese train-line print for the back. Zoom in on the picture above and see what the various stops are called: I love it. I think it’s the perfect print for a NYC baby. 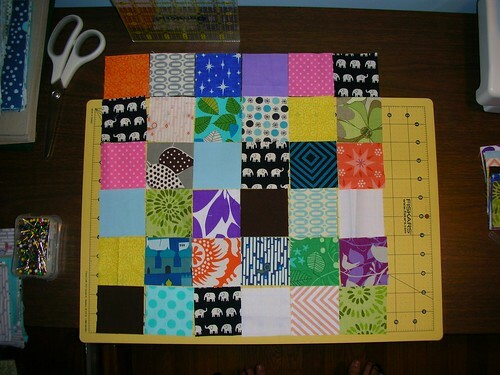 I was worried that I would find piecing the little squares together too tedious, but it turns out I really enjoy it! 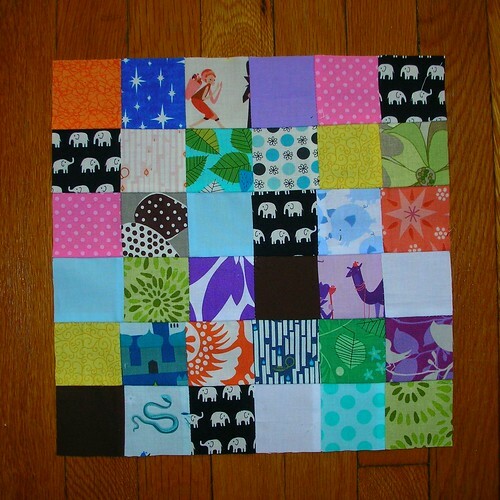 Neither of the two blocks I’ve finished so far are perfect, but they’re still really cute, if I do say so myself. I’m really looking forward to getting to work on this more! It’s been loads of fun so far. I’m going to free-motion quilt the little blocks with Elizabeth Hartmann’s Orange Peel pattern, but I haven’t decided what to do about the borders just yet. As for other projects, I’ve completed my second June and July blocks for the HST Block of the Month Quilt Along, and one August block. I pieced them all on the Singer 66, and one of them came out a little too small, but I can live with that. The Mabel messenger bag hasn’t really shifted much: I need to fuse the pieces with interfacing, now that it’s arrived in the mail, and start putting it all together. Simple Math has gotten a few more blocks trimmed, but that’s really quite tedious, so they’re not all done yet. Knitting-wise, I finished one pair of socks, and started another. I’ve still got a pair hanging out on the needles waiting for the cuffs to be finished, which might turn into a TV project, and my enormous baby-blanket-log-cabin project, for which I have to do only two more sections, but of course they’re the largest ones. Spinning-wise, I’m spinning up a merino/yak blend by Spunky Eclectic in a green-and-brown colorway called Walden’s woods, and I was making really good progress on it during the Olympics — now that I have fewer excuses to sit down in front of the TV, it’s going more slowly. 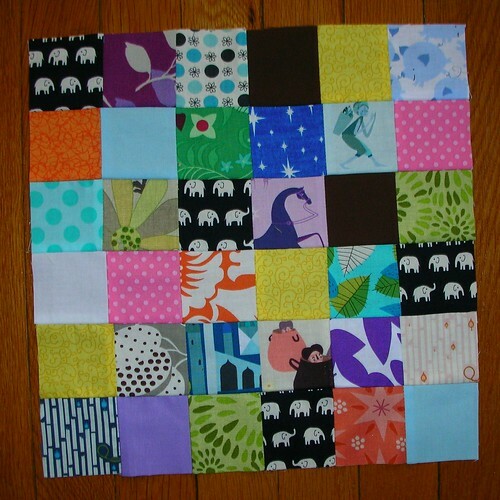 Very fun blocks- perfect for a baby quilt. I love postage stamp blocks- great stashbuster! Love your baby quilt, it’s turning out great! Thanks for linking up to WIP Wednesday.